General comments: A new one to spaceman at the time, this was the first venue of 2011. Boasting an interesting menu, featuring curries with sheep brain or trotters (no thanks), and a capacity over 200, Zouk (or Zouk Tea Bar & Grill to give it its full name) seemed to win over the Curry Night collective. 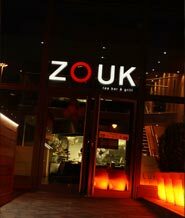 A subsequent visit in 2013 demonstrated that Zouk was still going strong as it was very busy, whilst our visit in 2018 involved being required to choose a set menu (what it gained in efficiency it lost in variety).
" Starters - a meaty spectacle on a very large silver platter was efficiently thrust upon us [thankfully onto the table]. Good meat, but the accompanying poppadom / sauce was lacking in the latter, only having a miserly half inch in the bottom of most of the pots. Main - don't know why, but was expecting a choice of murgh [chicken] or lamb, but we were all communing [the fun of a set menu]. A bit underwhelming for the price I thought. Drinkies - bit of confusion at our end between a large cobra and king cobra, prompting three wine coolers of king to arrive to mild embarrassment. A nice (if potent) tipple to top off the Peroni / Asahi liveners and before the [Estrella] at the [Thirsty] Scholar. So all in all, I was a bit disappointed with Zouk, the forced set menu resulting in food that was a bit average in places, and a general feeling of working to their convenience in a place that was only about half full - must do better! (Zouk, not spaceman). PS - spaceman showed stealthy undercover agent skills in appearing at Zouk when we thought he was behind us. Is he the new Jason Bourne/Jack Reacher / Bond. [It was as simple as crossing the road earlier and walking slightly faster due to a full bladder.]" "Poppadums - seem to have ditched the wholewheat editions referred to by Curry Night reviews passim, but the dips were tasty - particularly the mango chutney and the red stuff. Starter - a very meaty mixed platter - excellent post 5-a-side option, and the tikka chops were great. Good table positioning put me between two platters, freeing me to stuff my face with abandon [great strategy]. Mains - butter chicken / lamb saag? / lentil thingy - all nice enough - good chicken pieces, but the lamb was probably my favourite. The veggy option felt like it is probably produced in a massive vat kept on a constant low heat for days at a time, so that wasn't super. Was glad to have filled up [one's chops] on chops. I never get the feeling with Zouk that I'm being particularly looked after in terms of service, and the set menu didn't really help with that. Wasn't given any choice over sundries, which is a shame as I love an irregular naan. The plain naans provided were a bit crisp and nothingy. Real flower on the table was a nice touch of class. No disasters at Zouk to restrict enjoyment of a good curry night, but just couldn't be arsed to try - can't shake the feeling they'd be great if they wanted it a bit more. All in all, they're a Tandoori Mark Viduka or a Pilau Harry Kewell. A middle of the road 3 Australian journeymen out of 5. 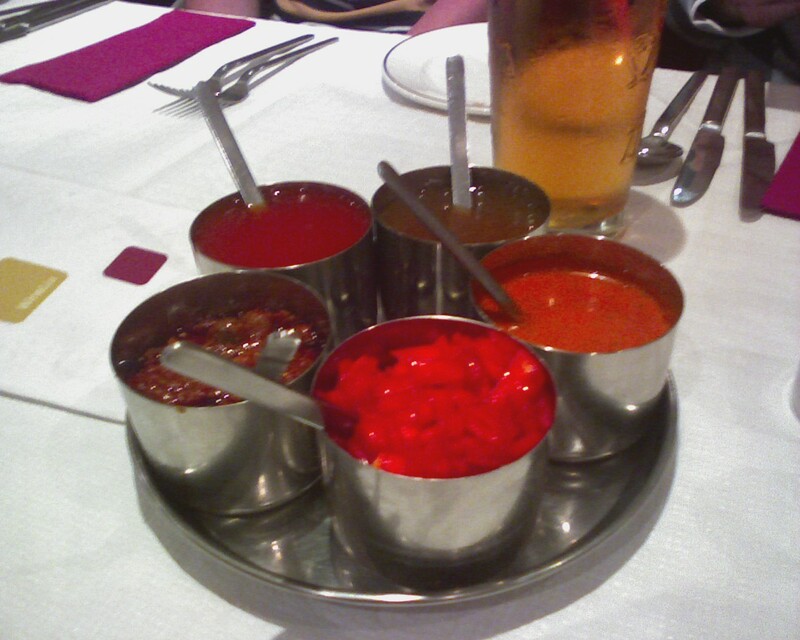 [An inventive analogy as always - truly you are the Leonardo da Vinci of Curry Night review analogy writing.]" "Having had the marketing forced through my ears via Capital FM every other advert (my own fault for listening to that radio station you may say [well, spaceman might have done but you got there first]), I was excited to finally try the supposed [ooh, biting] delights of Zouk Tea Bar and Grill. It has a nice atmosphere and is adequately nice inside (albeit with those impractical long benches for seating on one side of the table which makes it hard to get out [spaceman can vouch personally for this], but that doesn't overly bother me). The staff were attentive, if a little manic (which is fair given the influx of 19 people, although they were expecting us...). I would say it all went downhill when the food arrived. Personally, I don't like meat on the bone which rules out most of the starter selection brought to the table [perhaps half]. The main courses were either bland or overwhelmed by spice (not overly spicey, just lacking flavour). At least the poppadoms and Coca Cola were good. Let's not hurry back... [Yikes, not a great review there, but thanks for your honesty and high expectations, as usual. I guess their set menu policy didn't pay off this time.]" - my first experience of King Cobra - one I will repeat again [and presumably the next morning was the first time]." "And I realised I never got round to reviewing Zouk - apologies. One word - meh. 5.5 out of 10." "From the inaugural Curry Night... [certainly your inaugural Curry Night]. Zouk - not for me at all...would only ever return if heavily persuaded due to the level of curry houses in Manchester...4.2/10 [precise scoring mechanism]. Service - overall pretty slick and attentive I thought - maybe because I was distracted by Likesa's insults about my meal ("Your meal looks like s***" - this was re the lamb passanda). Annoying having to wait at the bar for the obligatory drink though, especially when there is no where to sit and wait [yes, they were so busy that we had to wait for a pre-booked table]. Other - generally a nice place, clean etc. Quieter than Akbars (a plus) so you could hear each other. I think MrsHenshaw would have been satisfied by the toilet facilities. Price - I can't remember! Was it about £25 each? :-/ [Um... sounds about right.] If so that's probably fair - I remember thinking that the mains are priced reasonably given it's a decent restaurant (not like those dodgy Rusholme joints) but they need to do more to compete with the likes of Akbars (on price) and Swadesh (on quality) for price/quality ratio. Overall I'd give it 7/10. [That reminds me - scoring chart needs updating.]" The place we went to for a drink before hand was an intriguing venue, which I have never been to before. The selection of beers was very good and generally I liked the atmosphere and would return in the future. Overall, an enjoyable evening, with many Curry Night enthusiasts present including our alumni (Likesa, Quincy to name but a couple). If I had one complaint it was that spaceman did not join the two enthusiasts previously mentioned and I for a post curry drink, an unusual blip in a normally excellent attitude to such practices. [It's a light-hearted jibe but spaceman feels compelled to offer some defence, which was mainly that it was quite late when we finally made it out and there was a taxi-sharing opportunity that were too good to pass up on.]" "I'll do it now (so I do it)... Great restaurant, interesting menu (pushed boundaries of Indian cuisine [although they probably aren’t that wide for us]) and reasonably priced. My only issues were with the dishes I chose. I had the quail as a starter (£5-ish) but this was a huge mistake - no meat and full of bones (as in every mouthful). I had a couple of scary bone-swallowing moments... I wanted the fish amritsari as a starter which was on the online menu but not in the restaurant. I wanted the Goan fish curry for main, but this was also on the online menu but not in the restaurant (grrrrrrr). On asking whether they could make the dish (the website contains words to t he effect that they can make pretty much anything), I was pointed in the direction of a prawn and salmon dish (£10?) which was "very nice" according to the waiter. The prawns were tiny and the sauce was way too tomatoey and spicy for the seafood. Really disappointed with the difference between the online menu and the restaurant one and with my choices, although I could see that lots of dishes looked nice so I think I was unfortunate. Nice poppadoms - ultra light and tasty although we needed more dips ideally. Rice was also good for pilau (I normally prefer boiled as the pilau is often too greasy for me, but the pilau here was very good). Service seemed fine. Desserts looked nice so will try next time I go. Overall 7.5/10 (although I suspect it would have been 8 or 9 if I had made different menu choices). Thanks spaceman." "As I am short for time (well, it is busy season after all), but would like to honour spaceman's website by giving a review, I will try and sum up the night via some quotes from the night. Before the quotes, I will also add the food was really nice, the place had a good atmosphere and helpful staff. It was a good night and I would definitely go there again. 4 out of 5. [Townie has since shed some doubt on the origins of the above quotes, but has yet to offer her view. Spaceman was on a different table and so cannot confirm or deny.]" "I was pleasantly surprised by the decor (modern, swish) and the size of the place. The bar stools looked mega cool but were really heavy to move. It took a while for the poppadoms to arrive, but it was worth the wait. They were the best I have tasted - very light, crispy and with nice tasting seeds in them. I thought the curry options on the menu were a bit limited - maybe this was because the menu seemed to extend beyond Indian cuisine [there was a grill section]. I ordered the Chicken Imlee to start and it was fab. The best starter I have had at a curry house. Succulent, tasty pieces of chicken with a fantastic (and unusual) plum sauce. Was a bit like having a Christmas curry. Disappointingly they did not have any sizzlers, so for main course I had to be adventurous and ordered Chicken Handi. This was fairly tasty and made of fresh ingredients and came in a cool black pot type thing. However, I thought it could have been a bit spicier (I ordered the medium but would go for the hot next time). The rice was great and came in little bamboo containers. I also liked the freshly made naan breads [yeah, they were very tasty]. The loos were fine - could have been a bit cleaner so 1/2 point deducted. All in all I was impressed with the decor and food - I'll give it 4 out of 5." "I was a bit of a late arrival [from working late], but was looked after well with the service despite this - I thought they were pretty attentive, and not overly pushy. Was slightly disappointed that the fish dish [amritsari, like Ozzy?] I'd been eyeing up on the online menu turned out to be as fictional as Santa Claus or Gilo's ability to eat curry, but the food I did get was all fine, despite the inauspicious start of a lack of red stuff for the poppadums [there was a possibly more authentic onion and cucumber salad type thing]. I didn't catch what my starter was (V-Ro had to order it for me), and it didn't stick in the memory, but was yummy enough for a hassled man necking beer [presume you're referring to yourself here]. The main was a well-tempered [I hate the moody ones] garlic chicken affair - overwhelming in portion size (but that's fairly normal for me - I can't handle the volume [that's 'cos of your four-course lunches]). If there was an exceptional piece of the food jigsaw puzzle it was the naans, which were particularly delicious. The music was thumpy and uplifting - not something I'd choose to listen to at home, but suited the dimly lit atmos[phere! ], ridden with birthday parties. My guess of who the birthday girl was was sadly incorrect, despite my rigorous and detailed logic (my pick was sat on the border between the young uns and the old folk, was glammed up more than anyone else, and was getting in every photo). Great turn-out, so top marks socially (although in theory the restaurant didn't provide that, it was obviously enough of a draw to get the masses out. It's like pulling teeth getting people to venture south to Rusholme and beyond!) Overall, it was like a stinking elderly alcoholic - fun to be around socially, never far from a beer, pleasant enough in almost every way, but could use a dip. And good bread. 3.75 out of 5, if that is a valid mark. Round up to 4 if not. [I've given up calibrating and just pick a number these days.]"